In this post we’re going to look at visual harmony and how creatives can produce great design, advertising and digital marketing when they employ the tried and tested secrets to creating visual harmony. With the notable exception of grunge and punk graphics, harmonious looking layouts, logo designs and graphics are the bedrock of great design. If you want to know why, read on! Visual harmony sounds pleasing enough but what is it exactly? Well, In the same way music can be discordant or achieve harmony by the alignment of frequencies between different notes, so design can be discordant or create harmony across the elements which comprise the design. When a note is played on an instrument a sound wave is produced. Sound waves are compressed and uncompressed air and travels through air from the source of the vibration to the receiver, in our case, the human ear. The distance between each compression denotes the frequency. Notes have specific frequencies which will, sonically speaking, align comfortably with other notes and through combination, make a new sound that is pleasing to the ear. Contrast this with discordant sounds where the frequency waves don’t harmonise but disrupt and therefore clash with each other. The same principles in sound relate to visual forms – where proportion and visual harmony have not been considered. In music, notes are set in a scale of twelve notes. These notes are essentially arbitrary divisions of the human audio frequency spectrum. When we play notes in a scale we are playing different frequency divisions or intervals. In music there are certain divisions like 3rds and 5ths which create pleasing sonic combinations. We can apply this proportioning with our visual forms too. The division of space or proportioning of form creates an optical structural relationship which the subconscious brain is attuned to and the conscious mind can notice and ‘read’. When our designs feature harmonious intervals we naturally find the design to be more pleasing. 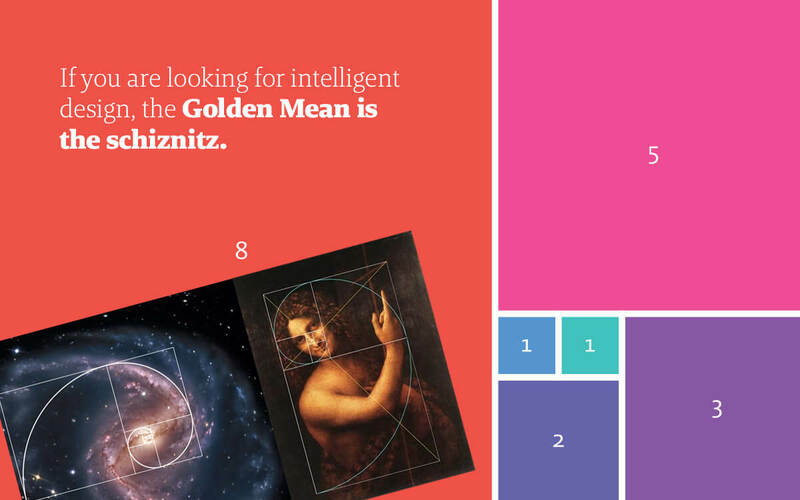 One of the most fundamental ratios in the universe is the golden mean or golden ratio. This ratio is set at 1:1.641 or if you want a quick and dirty rule of thumb; 40% to 60% or 2/3. When we divide a form using the golden mean we get two similar but unequal parts. These parts have a natural harmony to each other and collectively to the whole. The golden mean stipulates that the proportion between the smaller par to the larger part is equal to the proportion between the larger part to the whole. It can also be found in Fibonacci’s sequence of numbers (1.1.2.3.5.8.13.21.34) where each number is the sum of the preceding two. This simple formula produces numerical relationships which get ever closer to the golden ratio (1:1.614). This simple ratio is a founding principle of everything in existence. We’ll come on to how to apply this ratio later but for now let’s review why this ratio is considered a fundament of our existence. The advocate of left alignment and proportion, Jan is one of the most cited design thinkers ever. While he was concerned with the media of his time (the book), his thinking is timeless. If you want beautiful design, you need structure and proportion, and they don't come along by chance. The golden mean exists everywhere we look for it; It is there in the mating patterns or rabbits, the formation of hurricane and the entropy of a black hole to name just three well observed expressions. Designers and creatives have used this form for centuries to create some of the world’s most incredible and beautiful forms, from the ancient Greeks, who built the Parthenon, to Da Vinci’s last supper, it’s even used in the design of the iCloud logo. 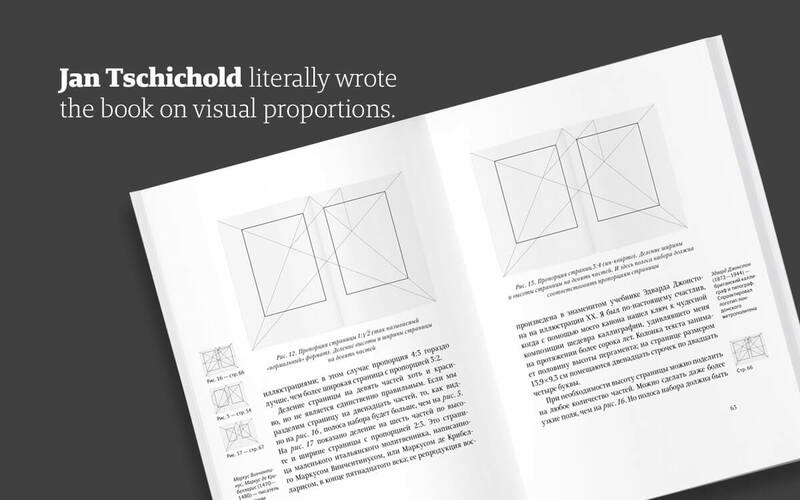 Highly influential graphic designer Jan Tschichold used the golden ratio for his book designs. The ratio was used to set the page size and margins, helping him create divine manuscripts whose design have lasted centuries. Visual harmony can also be considered not just in scale proportion of forms or the division of space but also in the proportion of typographic elements. For example, the contracts between headlines and initial paragraphs or between captions and body copy. It is by no mistake that the font size tools all use the same basic set of sizes as these have been set as design principles by careful consideration of visual harmony since the start of moveable type and the beginning of the Gutenberg universe. Colour too can be created harmonically. The chromatic spectrum has 360 degrees with colours harmonising according to different divisions much like notes on a scale. You can divide the spectrum in thirds for a Triadic harmony by setting the base colour then adjusting the hue by 120 and 240 degrees for the second and third colour respectively. In summing up, we can say great design has been duly considered from such perspectives and harmony applied or conversely, discordance applied knowingly. While ultimately ‘good’ or ‘bad’ creative work is a matter of taste, when a designer has knowingly applied such thinking to their work the results are more informed and pleasing irrespective of their ultimately harmonious or discordant nature. Well balanced design using considered rations just feels better to humans. The Golden Ratio governs our entire existence. If you look for it, you will find it everywhere, staring back at you with a "if you aren't freaked out, you just haven't fully understood me yet" look on its face.